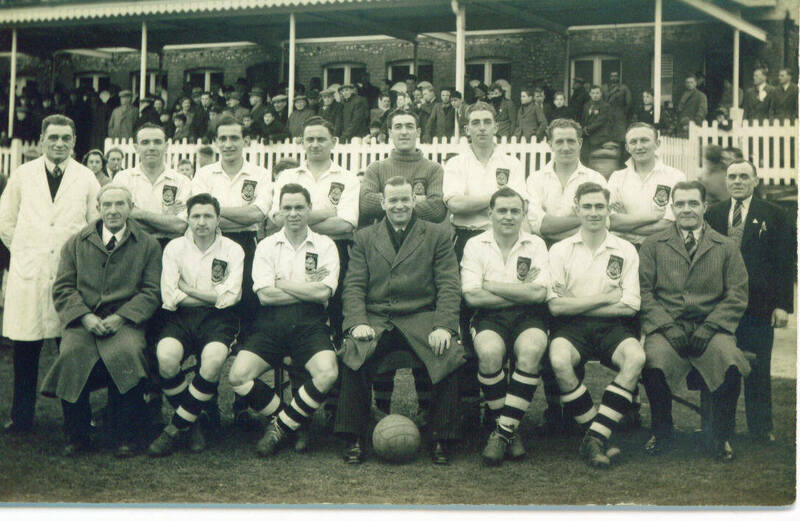 The 1949-50 team group, posing in front of the pavilion on the bottom pitch. Back row (Left to right): J.Thompson(Trainer), Jimmy Kelly, Les Smith, Bob Goddard, Ron Arnold, Bob Coulson, Jimmy Morley, Bob Greenwood, C.Gallagher(Assistant trainer). Front row: R.Speers(Secretary), Dave Morgan, Freddie Anderson, George Poyser(Player-manager), Johnny Sutton, Tommy Peters, Tom Lynch(Chairman, Supporters'Association).